My daughter is a family physician in Chicago. I had a large original oil of a tipi titled “Medicine Man Lodge” and I changed the title to “Medicine Woman Lodge” when she became a doctor and gifted the painting to her. 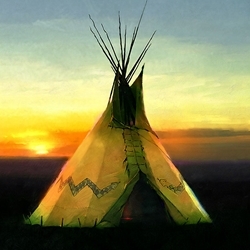 My son who is an attorney was visiting my daughter and after seeing the painting asked me if I had ever done a painting that could be considered a Lawyer tipi, and my response was that yes, I had painted a tipi called “Snake Lodge” by the Blackfeet. He liked this lawyer joke and I gave him the painting titled “L’Avocat,” which means “lawyer” in English.